The Crab Shack, 40 Estill Hammock Road, Tybee Island, Ga. Rob and I have discovered a certain phenomenon that happens when we share an outstanding meal. At some point, let’s say between bites 49 and 50, we glance across the table at one another. “Why aren’t we saying anything?” one of us will ask. The chewing stops for a moment. Then our mouths get busy again. The answer to the question is understood. The food is so good that conversation is unnecessary and discouraged. The last meal of our honeymoon trip to Georgia ignited this exchange multiple times. 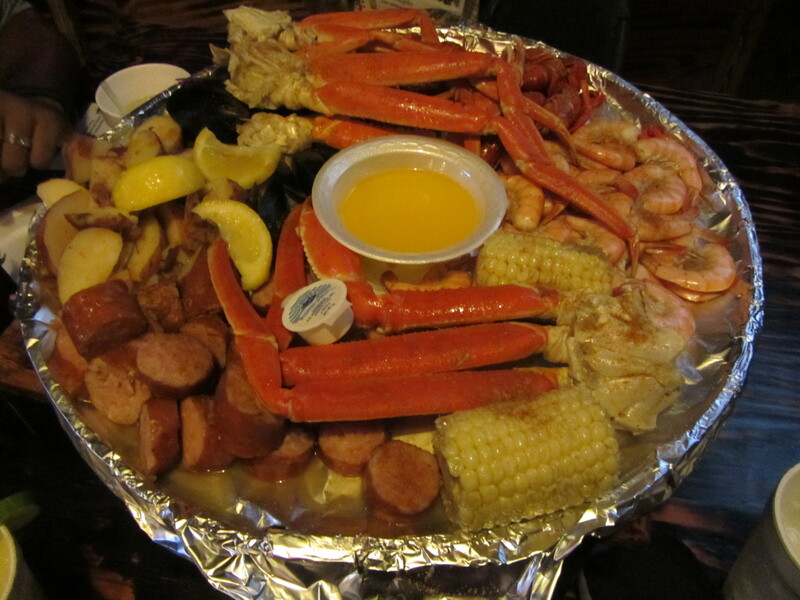 The subject of our marvel was The Shack Specialty at The Crab Shack, a seafood outpost in Tybee Island, Ga.
Tybee Island is a beach town on the Atlantic Ocean about 30 minutes east of Savannah. The road into town is lined with equal parts gift shops and seafood joints. But when dinnertime arrived, Rob and I headed away from the ocean, into a marshland area and through a gravel parking lot to find The Crab Shack. The Crab Shack wasn’t a plan. It was a serendipitous happening. But, it has been carefully managed as it morphs and grows so that the ambiance of it’s creek bank location, the lushness of the hundred year old live oaks dotting the property, the freedom of dining al fresco while watching dolphin play in the creek, and the taste of seafood so fresh you want to slap it, will never be lost. It was hard to see all of the beauty surrounding The Crab Shack for our late-dinner date. But we had ringside seats at a table next to the misty alligator pit and a TV showing Hurricane Isaac coverage. After a round of drinks (beer for The Mister, frozen margarita for the lady) and a chat with the waitress (a recent Tybee transplant from Kentucky), Rob and I ordered The Shack Specialty for two ($39.99), “a platter piled high with an assortment of tasty shellfish that are in season with corn, potatoes and sausage.” That night’s selection included king crab legs, shrimp, crawfish and mussels, all fresh from the water and steamed with a generous dousing of Old Bay-like seasoning. 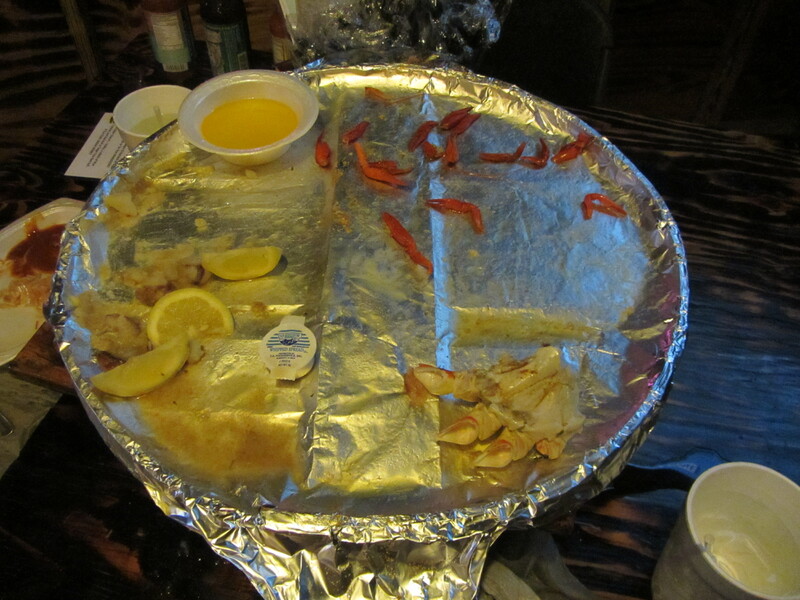 We sprang into action, devouring the poor little crustaceans while they were still steaming. Conversation stopped, but the noises picked up. We cracked shells to get to fleshy meat inside. We licked butter off our fingers. We sucked the crawfish heads, for goodness’ sake. It was the most disgusting display that I, lifetime meat-eater, had ever been a part of. And it was the most fun meal I’ve ever had. The waitress had mentioned something about a to-go box. By the time we finished, only a few empty shells, lemon wedges and crawfish arms dotted a platter that arrived full a half hour earlier. Rob and I eventually slid out of our chairs, washed the buttery goo from our fingers and headed toward our rental sedan. We were empty-handed and still pretty awestruck by what we just experienced. But we left The Crab Shack full, fat and happy.